The essence of Ukrainian Maidan: can we call it a revolution? The February events in Ukraine were perhaps the most intense political developments over the last few years in the post-Soviet territory. 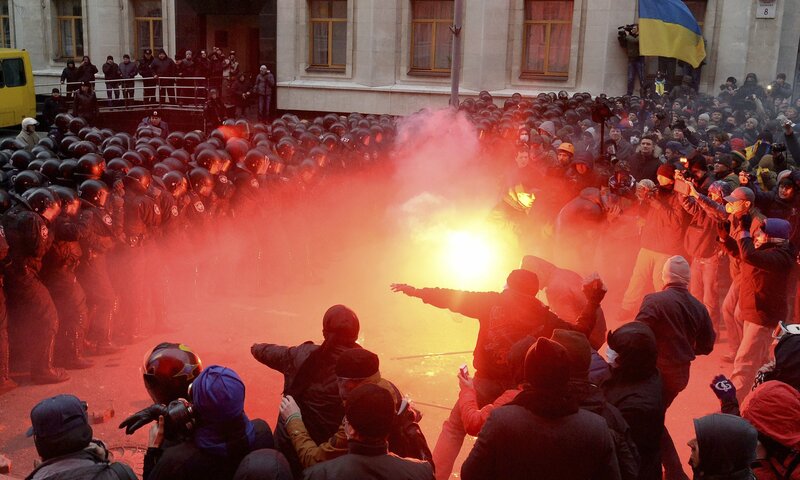 The Ukrainian civil protest, or Euromaidan, was unanimously labeled as a revolution by mass media. Different names were used, such as the “Ukrainian revolution”, “revolution of dignity”, “revolution of conscience”, etc. Can we, however, really call it a revolution? This may not be the case at all due to several reasons. For one thing, political science defines revolution as a drastic change of the socio-economic and political mode of society implemented by radical means within a short period of time. Up until now, however, no quick radical changes in the socio-economic and political fields have been fulfilled by Maidan. If one had asked the protest leaders about the revolutionary changes they wanted, he would have heard something like removing Yanukovych from power, eliminating corruption, improving living standards, democratization and the like. However, these things have been talked about since Ukraine gained independence in 1991, and there is nothing new and revolutionary about them. In short, as per the definition there was no revolution in its classical understanding in Ukraine. For another thing, even a quick analysis of the composition of the new powers shows that nothing but cosmetic changes took place with the old system still in place. The members of the Yatsenyuk government, formed from the opposition to Yanukovych, are coming from the same anti-national system that has reigned in Ukraine since it acquired independence. The first assignments to the government already displayed incompetent individuals with doubtful reputations and corruption records. Naturally, the Ukrainian people are dissatisfied with the behind-the-scenes formation of the new government based on party affiliation of the candidates rather than on their expertise. Let me bring up just a few examples here. The Vice Prime Minister of Energy Nikolai Martynenko was heavily charged with corruption in 2005, after which Yulia Tymoshenko’s government was forced to resign. The Fuel and Energy Minister Yuriy Prodan was the Fuel and Energy Minister under Tymoshenko and the 1st Deputy Director Head of the infamous “UkrEnergo” company. The Minister of the Interior Arsen Avakov is a multimillionaire with a criminal record for misappropriation of the 55 hectares of land, and has been residing in Italy since 2010. The Minister of Labour and Welfare Lyudmila Denisova is known to have reduced unemployment rate in Ukraine by modifying the criteria of statistics gathering. The Minister of Economic Development and Trade Pavlo Sheremeta is affiliated with a Ukrainian oligarch, Victor Pinchuk. The interim president Alexander Turchinov did not pass even a 3% threshold at the Kiev mayoral elections. On a final note, the renewed Verkhovna Rada (Ukrainian parliament) includes the same deputies who voted for the anti-protest laws on January 16, 2014. The following conclusions can be made here. Firstly, a real revolution must entail a radical program of systemic changes that will be fought for. It is a deep and qualitative shift in the development of the society accompanied by the gap with the preceding mode. In this regard, Ukraine has not witnessed a revolution yet. Secondly, the current interim government is not composed of revolution leaders, and there is again an inherent disconnect between the will of the Ukrainian people versus that of the powers that are out there. Finally, since the recent protest did not lead to revolutionary changes, including the transfer of power and national wealth from corporate business (oligarchs) to the national-oriented elites, a true revolution is yet to come. This entry was posted on 10/03/2014 by ISIS Europe in Opinions and tagged Alexander Turchinov, euromaiden, Lyudmila Denisova, mass media, nikolai martynenko, revolution, russia-ukraine, ukraine, ukrainian revolution, Verkhovna Rada, Victor Pinchuk, Yulia Tymoshenko.